A man who federal agents say is a main character in the infamous unsolved mystery about the disappearance of Jimmy Hoffa is breaking his silence after decades of refusing to answer questions. The reputed gangster says the union leader was buried in a field in suburban Detroit -- about 20 miles north of the restaurant where he was last seen. Eighty-five years old and barely able to walk, Tony Zerilli never thought this day would come. It’s certainly not what you would expect to hear from a man who the feds say was once a high-ranking member of the Detroit La Cosa Nostra family. “He actually had risen up at one point to the underboss – or second in command,” Andy Arena, former head of the FBI for New York and Detroit, said of Zerilli. Former U.S. Attorney Keith Corbett, who prosecuted organized crime in Detroit for 20 years, says Detroit's mafia families share blood relations in addition to their sworn bonds and that's one reason the mystery of what happened to Hoffa has gone unsolved. In July 1975, Hoffa told people he was going to meet two men at a restaurant in suburban Detroit. One was a suspected member of the Detroit mafia. The other was a Teamster boss from New Jersey. Hoffa, who’d been investigated for dealings with the mafia, was seen at the restaurant -- and then never again. “Organized crime was involved in the disappearance of Jimmy Hoffa,” Corbett said. “I think the interesting thing about the Hoffa disappearance was that it was compartmentalized to only a few people, " Arena said. "They kept that thing quiet." Quiet until now. Zerilli says he wants to set the record straight about his life -- and what happened to Hoffa. Zerilli denies ever being in the mafia or having anything to do with the disappearance of Hoffa. 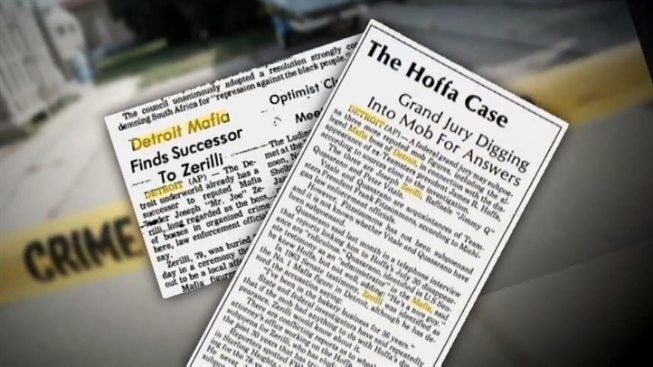 "What happened to Hoffa had nothing to do with me in any way, shape or form,” Zerilli said. Zerilli says he was crushed when Hoffa vanished. It was news he received while behind bars after he was convicted for being involved in illegal operations in Las Vegas casinos. “They accused me while I was away," Zerilli said of his time in prison. "If that’s not an alibi I don’t know what the hell an alibi is." Still, when Zerilli was released from prison, the feds were all over him -- they demanded information about Hoffa’s disappearance. That didn’t do much good back then and even today Zerilli says he refuses to name names. “I’m not a stool pigeon,” he said. But the feds are convinced that Zerilli knows what happened. “Clearly when he returned he would’ve been a person, based on his position in the hierarchy, who would have been able to learn the facts and circumstances surrounding the disappearance of James Earl Hoffa,” said Corbett. Zerilli says he’s been frustrated over the decades to watch the FBI chase countless tips from publicity hounds seeking attention by saying they know Hoffa’s burial spot -- rumors that have included locations around Detroit and the Meadowlands in New Jersey. “All this speculation about where he is and he’s not," Zerilli said. "They say he was in a meat grinder. It’s all baloney." The truth, Zerilli says, is that Hoffa never got very far from where he was last seen. He believes the union leader's final resting place is about 20 miles north of the restaurant where he was last scene, in a field in northern Oakland County, Mich. He was buried in a shallow grave and the plan was to move the body at another time, but Hoffa's remains were never moved from the first spot where they were buried, Zerilli said. "Once he was buried here he was buried and they let it go,” Zerilli said. When told about Zerilli’s revelations, Corbett, a man who’d worked organized crime in Detroit for two decades, was flabbergasted. For his part, Zerilli wants closure for himself and Hoffa’s family. “I’d like to just prove to everybody that I’m not crazy," Zerilli said. "And it means a lot to me. What happened, happened while I was in jail. And I feel very, very bad about it and it should never have happened to Jim Hoffa. He didn’t deserve what happened to him. Zerilli also wants a payday. He's working on a book and has a web site, hoffafound.com. He believes that he can make money if -- and when -- Hoffa’s body is found in that field. He’s waiting on the FBI to make the next move.